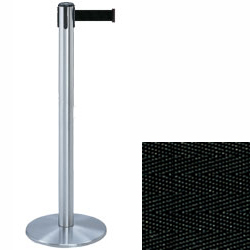 These chrome stanchions with black belt make great crowd control stands for any locations because of their sturdy metal fabrication. 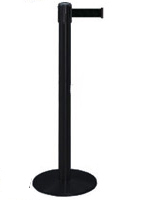 Each of the posts additionally features a round weighted base that keeps them sturdy in high traffic areas. 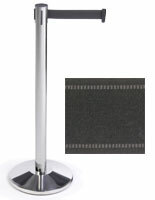 The chrome stanchions weigh 24 lbs. 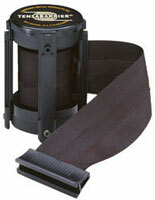 and their retractable strap measures 13' in length and 2" in width. 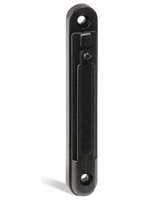 The metal stands also has three receivers for connecting to other crowd control poles. 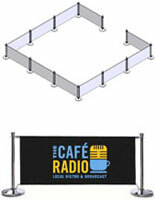 Stanchions like these with a long band are great for businesses that want a simple way of forming lines with fewer fixtures. 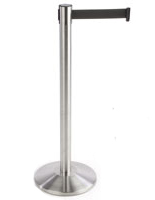 The stands' round base have a diameter of 13.5".